In the wake of continuing hostilities along the Southern border, and ongoing media coverage in which law-abiding firearms retailers are often inaccurately portrayed, the National Shooting Sports Foundation (NSSF) - the trade association for the firearms industry - and the Bureau of Alcohol, Tobacco, Firearms and Explosives (ATF) is focusing its 2013 Don't Lie for the Other Guy anti-straw purchasing campaign in two Southwestern border states. The 2013 Don't Lie program is under way with campaigns focused on the El Paso, McAllen/Brownsville and Laredo, Texas markets, as well as in the Phoenix and Tucson, Arizona areas. "With increased media and legislative scrutiny concerning straw purchases of firearms along the border, it is imperative that federally licensed firearms retailer , and the industry as a whole, demonstrate just how seriously we consider the criminal acquisition and misuse of firearms," says Lawrence G. Keane, NSSF senior vice president and general counsel. 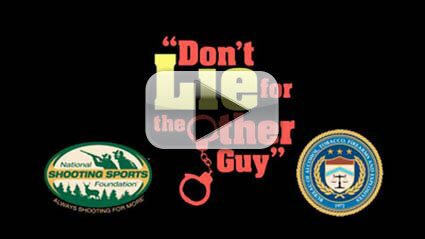 The Don't Lie campaign was developed jointly in 2000 by the ATF and NSSF and is designed to raise public awareness that it is a serious crime to purchase a firearm for someone who cannot legally do so or for someone who does not otherwise want his or her name associated with the purchase. There are two primary components of the program. First, to make the public aware that it is a serious crime to "straw purchase" a firearm. 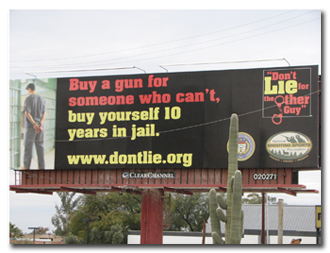 To accomplish this, NSSF engages in an extensive public awareness campaign where residents and visitors to Don't Lie border cities will see posters, billboards and bus signage (and hear PSAs) with the Don't Lie message in English and Spanish that anyone attempting an illegal firearm purchase faces a stiff federal penalty: Buy a gun for someone who can't and buy yourself 10 years in jail. The second component of the Don't Lie campaign focuses on retailer education through which NSSF helps ATF to educate and train firearms retailers to be better able to identify and prevent illegal straw purchases. To accomplish this, NSSF reaches out to firearms retailers in the launch area making them aware of the program and offering them a free Don't Lie retailer kit. Each kit contains a training video and informational brochure for storeowners and their staff, as well as point-of-purchase displays aimed to raise awareness and deter illegal straw purchases. Retailer participation in Don't Lie sends a clear message to media, law enforcement and criminals alike. It says that firearms retailers understand that they are, in fact, the first line of defense against straw purchasing and, accordingly, are taking real steps to make sure that they do not occur.